Ole Christensen Rudd was born in late spring/early summer of 1791 at Røråsen Farm on the island of Helgøya in Næs, Hedmark, Norway (now officially in Ringsaker commune).A His parents were Christen Olsen Ruud, a day laborer, and his wife Ingebor Amundsdatter Kjos. Ole was baptized in Nes Church in Tingnes parish on the 31 Jul 1791. The church sits on the opposite shoreline north of the island of Helgøya and is a stone English Gothic style church built about the year 1250. It has an inscription band and ring on the door dating to the middle ages, and it seats roughly 320 people. It's likely that Ole's father Christen moved the family south (about 80km/50mi) from Østre Gausdal in search of work in early 1791 (Ole's older sister Beret/Berthe had been born 1789 in Østre Gausdal). The reason for the family's relocation is unknown, but it seems Helgøya may have offered work in a local limestone quarry and we assume that this drew Ole's father to the area. Ole was one of 9 known children. He had 3 older sisters: Mari, Marthe, and Berete; a younger sister Anne; and 2 younger brothers who died by the age of 1, both named Amund. Ole also had 2 half-siblings: the first died in infancy and Olaus, who was born in 1808. Ole's family had just moved to Nes in Hedmark, but soon encountered an endless string of problems farming the land. The 1790s were plagued with issues. Multiple years of an uncanny amount of pestilence led to sequential years of crop failures and famine across the region. To survive, in early 1795, Christen took a hit and sold the farm for 1150 riksdaler, far less than the 1699 he purchased it for. * The family relocated again. This time their new residence was in Hurum in the county of Buskerud. 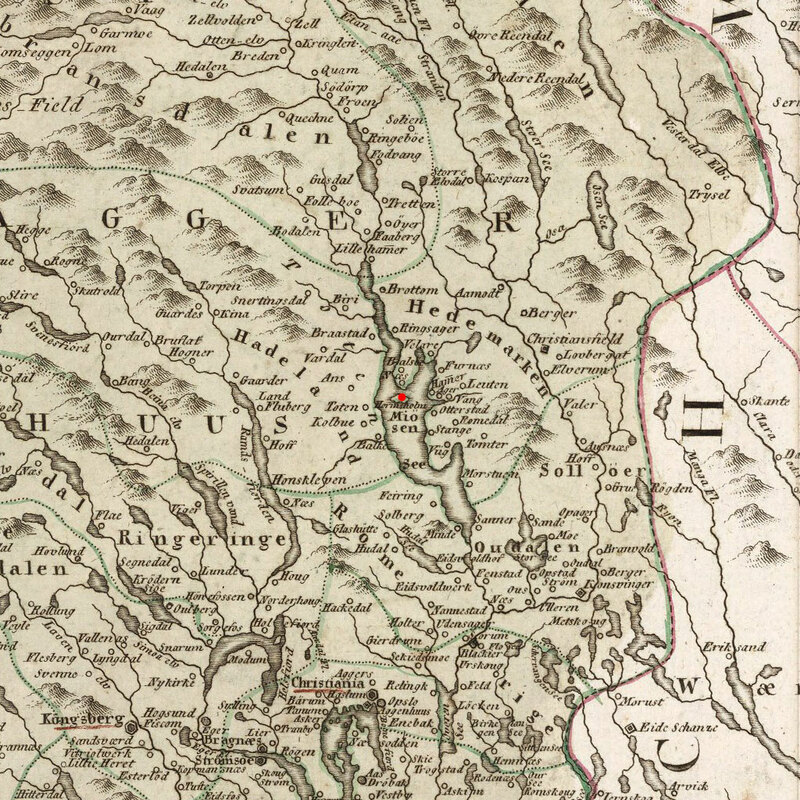 Ultimately, their journey south would total 260 km [160 mi] from the Ruud farm in Østre Gausdal (north of Lillehammer), to Svelvik (south of Oslo). The glass-works (Glassverket) at Hurum was where Ole called home over the next three years. It was located along the east side of the Svelvikstrømmen fjord, opposite the villages of Svelvik and Strømmen (Pieces of glass can still be found washed up along the beach in Hurum where the glass-works used to stand). During normal production, his father worked with roughly 12 other day laborers to assist 10 glassblowers in making glass bottles. The family was one of 21 families living at the Glass-works. There, Ole saw the birth and death of two younger brothers, the death of his mother Ingebor in March 1799 and his father's remarriage in December of the same year. Shortly after his father remarried, the Ruud family relocated to the town of Svelvik along the opposite shoreline of the fjord. Here, Ole spent the rest of his childhood and teenage years living with his older sisters, father and step-mother. He can be found here counted on the 1801 census along with his mother & father, and sisters Anne & Marthe. After Ole's confirmation he took to the seas, as did many other men in the seafaring town of Svelvik. He started out as a ship's boy and climbed the ranks to become an seasoned sailor. 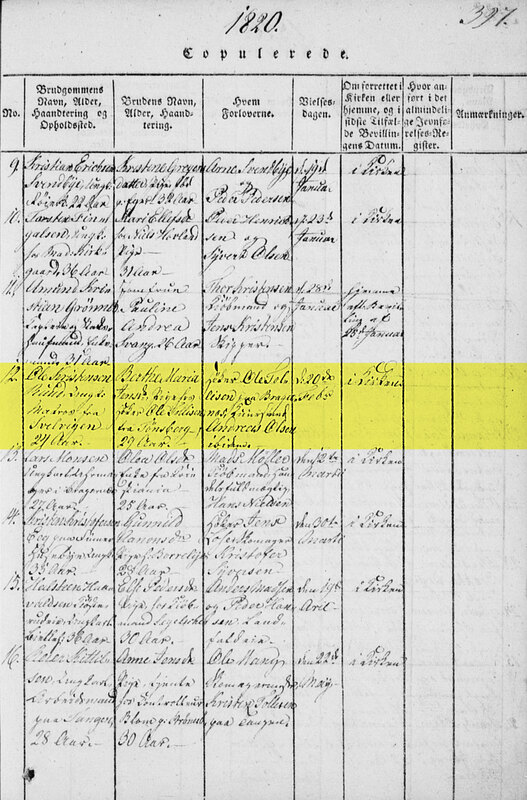 Ole's documented as being a sailor as early as 27 year old when his nephew Peder Andersen is baptized in early 1819. Berthe Marie, known in the family as Berthe-Dol, was born in 1786 and baptized at Vaar Frue Church in Tonsberg on 27 Jul 1786 to parents Jens Johannesen Sodstad and Anna Maria Olsdatter. Her parents died early in her life. 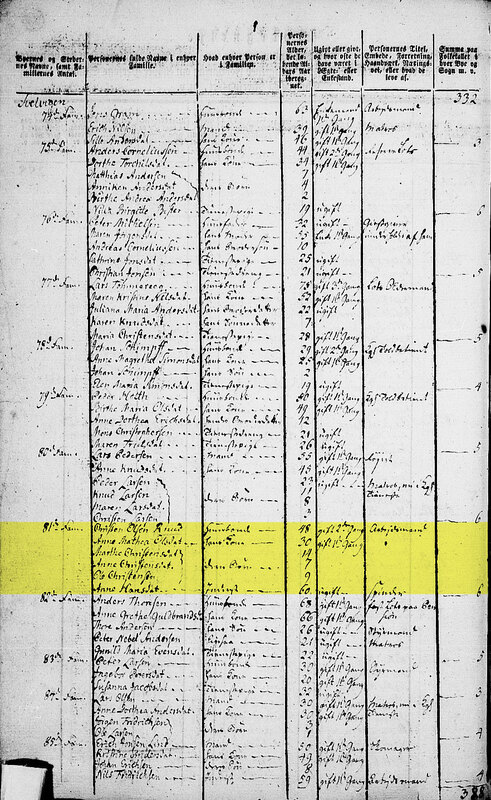 We know her father passed around the 18 Apr 1793, but absolutely nothing is known about her mother. It is assumed she passed away around the time of her husband, but was definitely missing before 1801. By 1801 Berthe was being raised in the care of Ole Tollisen who is listed as her foster parent. She was confirmed under his care in 1802 at St. Laurentii Church. Sometime in the following years, in a move that was likely work related, Berthe relocated from Tonsberg to Drammen, Buskerud. Berthe moved to Svelvik with Ole where they raised six children together. Jens Christian was born in Nov 1820, Ole in Jun 1823, Johan Andreas in Sep 1825, Anne Marie in Oct 1827, Anders in Jan 1832, and Inger Andrea in Jul 1836. Ole died at the age of 73 on the 10 Mar 1865 in Svelvik. His cause of death was listed as "old age". He was buried on the grounds of Svelvik Church 7 days later. Berthe lived another two years in Svelvik and died on New Year's Eve 1867 at the age of 81. She was also listed as dying of old age and was buried 8 Jan 1868 on the church grounds. * Christen's agreement to purchase Røråsen also included paying "føderåd" for two people. Føderåd was essentially old Norway's version of retirement that functions more like child support. You would sell your farm or property and in turn the purchasing individual would agree to a regular fee to support you. B Ole sailed on the seas in Norway before the existence of the Norwegian Sailors Roll. Because of this there is no record of when and where he sailed, and when he docked. If these roll existed during Ole's time, they may have provided confirmation of crossing paths with Berthe in Drammen if his boats frequently sailed out of Drammen. Source information is not yet ready for Ole's page. 1 Norway Parish Registers, Baptism Records about Andreas Johnsen; The National Archives of Norway: The Digital Archives; Oslo, Norway; (http://www.arkivverket.no/URN:kb_read?idx_kildeid=8433&idx_id=8433&uid=n...); Visited:13 Jan 2014 ; Buskerud county, Hurum, Parish register (official) nr. 10 (1827-1846), Birth and baptism records 1830, page 46, entry no. : 60. 2 Norway Parish Registers, Confirmation Records about Andreas Johnsen; The National Archives of Norway: The Digital Archives; Oslo, Norway; (http://www.arkivverket.no/URN:kb_read?idx_kildeid=8433&idx_id=8433&uid=n...); Visited:13 Jan 2014 ; Buskerud county, Hurum, Parish register (official) nr. 10 (1827-1846), Confirmation records 1845, page 325; Entry: 12, bottom half. 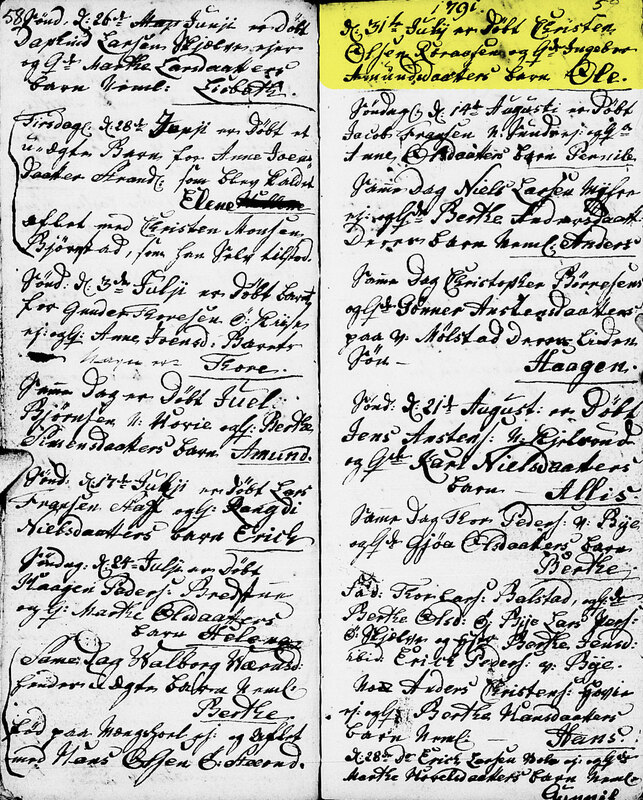 3 Norway Parish Registers, Baptism Records about Anne Maria Olsdatter Ruud; The National Archives of Norway: The Digital Archives; Oslo, Norway; (http://www.arkivverket.no/URN:kb_read?idx_kildeid=8433&idx_id=8433&uid=n...); Visited:13 Jan 2014 ; Buskerud county, Hurum, Parish register (official) nr. 10 (1827-1846), Birth and baptism records 1827, page 13, entry no. : 101. 4 Norway Parish Registers, Confirmation Records about Anne Marie Olsdatter Ruud; The National Archives of Norway: The Digital Archives; Oslo, Norway; (http://www.arkivverket.no/URN:kb_read?idx_kildeid=8433&idx_id=8433&uid=n...); Visited:13 Jan 2014 ;Buskerud county, Hurum, Parish register (official) nr. 10 (1827-1846), Confirmation records 1842, page 318; Entry: 6, bottom half. 5 Norway Parish Registers, Marriage Records about Andreas Johnsen and Anne Marie Olsdatter Ruud; The National Archives of Norway: The Digital Archives; Oslo, Norway; (http://www.arkivverket.no/URN:kb_read?idx_kildeid=1095&idx_id=1095&uid=n...); Visited:13 Jan 2014 ; Buskerud county, Hurum, Parish register (official) nr. 11 (1847-1860), Marriage records 1855, page 280, entry no. : 29. 6 Norway Real Estate Registers about House 11a; The National Archives of Norway: The Digital Archives; Oslo, Norway; (http://www.arkivverket.no/URN:tl_read?idx_id=15016&uid=ny&idx_side=-103); Visited:13 Jan 2014 ; Svelvik. Aut. 11.04.1858. S. 3: innholdsfortegnelse. S.5: redgjørelse. S. 7: reg. til register for Svelviks grunde. S.9: alfabetisk register over eiere. S. 47: reister over husene i Svelvik etter matr.nr, pg. : 173-174; cite note on. : Andreas Johnsen, p 173. 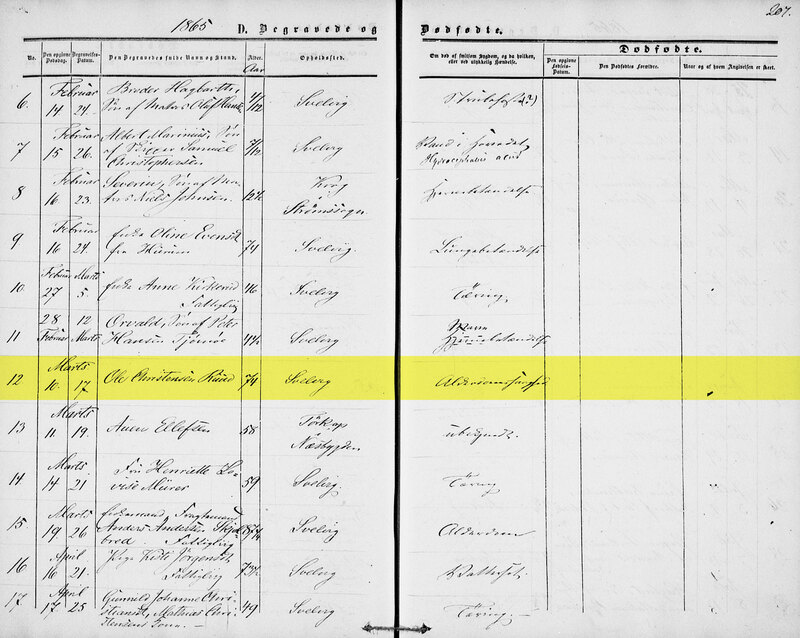 7 1865 Norway Census about Andreas Johnsen Family; The National Archives of Norway: The Digital Archives (Digitalarkivet); Oslo, Norway; (http://digitalarkivet.no/cgi-win/WebCens.exe?slag=visbase&sidenr=29&filn...); Visited:13 Jan 2014 ; Vestfold county, Svelvik, Census of Svelvik, Entry No. : 84-90; Family No. : 15. 8 Norway Parish Registers, Death & Burial Records about Anne Marie Ruud; The National Archives of Norway: The Digital Archives; Oslo, Norway; (http://www.arkivverket.no/URN:kb_read?idx_kildeid=1273&idx_id=1273&uid=n...); Visited:13 Jan 2014 ; Vestfold county, Strømm, Parish register (official) nr. 1 (1861-1869), Death and burial records 1867, page 219, entry no. : 51. 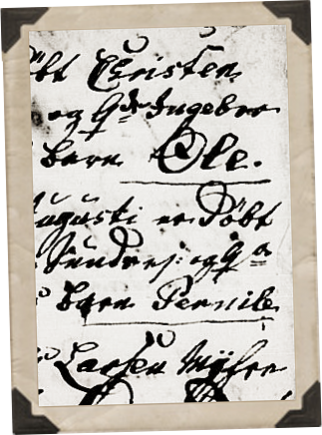 9 Norway Parish Registers, Baptism Records about Andreas Marinius Andreasen; The National Archives of Norway: The Digital Archives; Oslo, Norway; (http://www.arkivverket.no/URN:kb_read?idx_kildeid=1273&idx_id=1273&uid=n...); Visited:13 Jan 2014 ; Vestfold county, Strømm, Parish register (official) nr. 1 (1861-1869), Birth and baptism records 1867, page 68, entry no. : 48. 10 Norway Parish Registers, Marriage Records about Andreas Johnsen and Olava Andersen; The National Archives of Norway: The Digital Archives; Oslo, Norway; (http://www.arkivverket.no/URN:kb_read?idx_kildeid=5938&idx_id=5938&uid=n...); Visited:13 Jan 2014 ; Vestfold county, Strømm, Parish register (official) nr. 3 (1870-1877), Marriage records 1873, page 9, entry no. : 4. 11 Norway Parish Registers, Death & Burial Records about Olava Andersdatter; The National Archives of Norway: The Digital Archives; Oslo, Norway; (http://www.arkivverket.no/URN:kb_read?idx_kildeid=5611&idx_id=5611&uid=n...); Visited:13 Jan 2014 ; Vestfold county, Strømm, Parish register (official) nr. 2 (1870-1877), Death and burial records 1874, page 218, entry no. : 41. 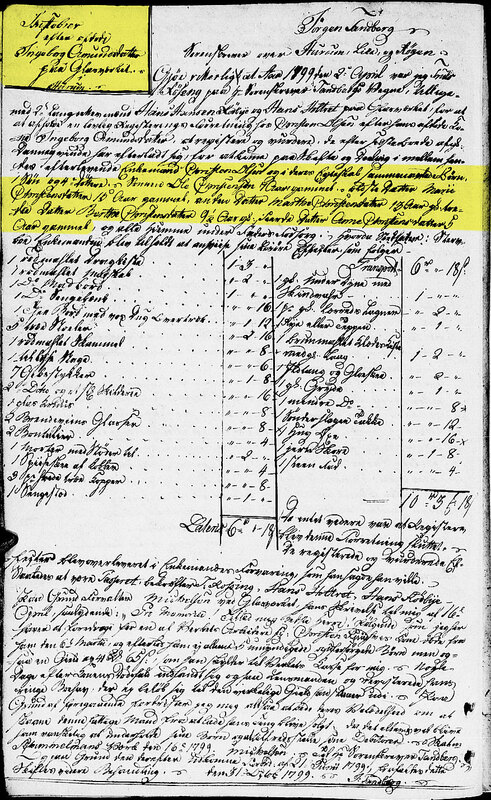 12 1885 Norway Census about the Andreas Johnsen Family; The National Archives of Norway: The Digital Archives (Digitalarkivet); Oslo, Norway; (http://digitalarkivet.no/cgi-win/webcens.exe?slag=visbase&sidenr=11&filn...); Visited:13 Jan 2014 ; Vestfold county, Svelvik, Census of Svelvik, Entry No. : 116-130; Family No. : 20. 13 Norway Parish Registers, Death & Burial Records about Andreas Johnsen; The National Archives of Norway: The Digital Archives; Oslo, Norway; (http://www.arkivverket.no/URN:kb_read?idx_kildeid=3542&idx_id=3542&uid=n...); Visited:13 Jan 2014 ; Vestfold county, Svelvik in Strømm, Parish register (official) nr. II 1 (1878-1899), Death and burial records 1888, page 240; entry no. : 8.